I’m very excited to be able to introduce this interview with Jeff Goins. Jeff is a blogging phenomenon, and generously shares his recipes for success on his blog and in his book, ‘You are a Writer’. I am a huge fan! Last summer he released his first mainstream-published book, Wrecked, on compassion and the surprising truth of how others’ suffering can enrich your life. I reviewed it here. He very kindly agreed to be interviewed for my blog. Here it is! T: Hi Jeff- thanks for stopping by. For the benefit of those who don’t know you, what are the top three things people need to know about you? J: 1. I’m old enough to drive (despite my baby face). 2. I am NOT Rupert Grint (AKA Ron Weasley). T: You’re a relatively new father. What’s the cutest thing your boy is doing at the moment? J: The other night he was crying as I was trying to put him to sleep. And as he was screaming, I put out my hand and wrapped his whole hand around my finger. He didn’t stop crying, but he clutched my pointer finger as hard as he could. I couldn’t help but smile. It was a cool picture of what I mean to him — and what he means to me. T: Your book is called ‘Wrecked’. What is the idea behind it? J: Wrecked is about the life we’re afraid to live. It’s a call to compassion and commitment, living a story that is bigger than us. In a nutshell, it’s ten short lessons on how we find our purpose when we reach out and serve a world in need. T: There are some who feel more deeply than others the suffering of the world. How are compassion and art related – (both in general and for you specifically)? J: Art makes us feel. Compassion is about identifying with the needs of a broken world and feeling what others feel. Often good art can put us in touch with the needs of that world. Ever noticed how a sad song or emotional movie can move you more than a happy-go-lucky one? There’s a reason for that. We were made to feel empathy towards those in need. T: What has been your personal experience of suffering? J: I feel pretty privileged to not have experienced a lot of personal pain in my life. With that privilege comes a sense of responsibility, so I try to put myself into situations where there is pain or suffering so that I can grow in my compassion towards others. The first time I really had a brush with a world in pain was when I met a homeless man on the streets of Seville. I took him out for a burger — a simple gesture, really — and he told me no one had ever done that before. I was floored. Who else was out there, waiting for someone to notice them? T: What is your favourite Bible passage on the subject of suffering (and why)? J: John 11:35: “Jesus wept.” That says it all right there. T: There are some who care deeply about others’ suffering but feel helpless to offer anything, perhaps because (like me) they are housebound with chronic illness or overwhelmed by their own responsibilities and needs. What suggestions would you have for someone who wanted to do something about the suffering in the world but feels helpless to do so? J: You can give your heart. Your prayers, your love, your attention. The fact that you care is something. There is an economy that goes beyond dollars and blankets and food. Sure, those things are important, but they are the only materials we have to give or receive. 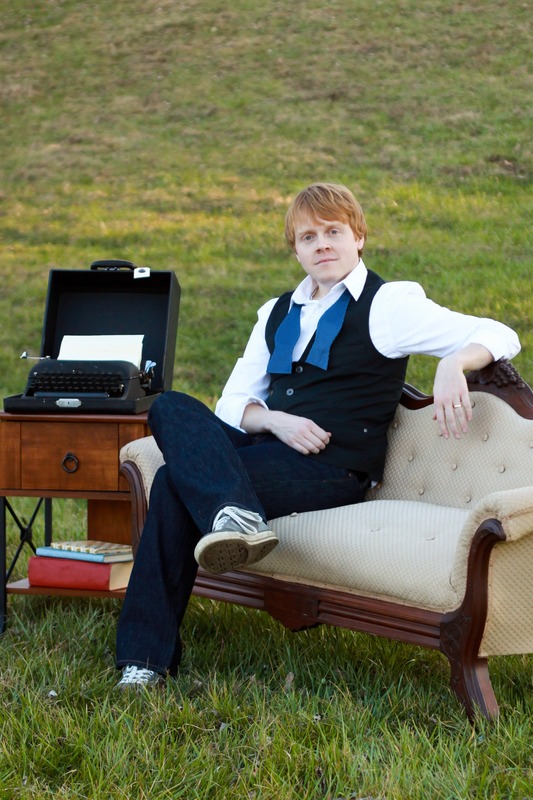 Jeff Goins is a blogger, speaker and author. He works for Adventures in Missions, a nonprofit, where he serves as the Communications Director. In his free time, he writes books and shares ideas worth spreading. He blogs at goinswriter.com. For more information about Wrecked click here, and to buy it from Amazon click here. Hi Jeff! So good to ‘meet’ you. I am impressed! I want your book. I’m going to read your blog. Thank you for the tangible ways you’ve shown that a seeming ‘nobody’ can really DO something, even by committing for a season to a most worthwhile cause…reaching out in Jesus’ Name to one in dire need. Blessings, brother!